Special Notice: M.K. Davis and I, while working on a documentary in the Honey Island Swamp discovered evidence that suggests the Honey Island Swamp Monster is likely a hoax. You can download or stream our documentary from this web site. Select VIDEO from the Side Slider menu and click on the Honey Island Swamp Monster Documentary. It's only 15 minutes long. More evidence can be found on the "Latest Evidence" page. The Honey Island Swamp Monster "Legend" will probably live on, but as you will see...there is no physical evidence of the existance of this creature. It was 1963 and Harlan Ford with his buddy Billy Mills were in the deep woods of the swamp looking for an old abandoned camp they had spotted for the air. Harlan was an Air Traffic Controller in New Orleans and he often flew over the 70,000 acres of swampy wilderness in southern Louisiana. Today the two skilled hunters were on foot and making their way back deep toward where Harlan thought he had seen the camp. When they broke out into a clearing they stopped in awe, in front of them was a massive creature on all fours. Billy asked "What is that thing!?!" The creature heard him and stood to face the two startled men. After a few seconds of eye contact it took off into the thick brush. With rifles in hand Harlan and Billy ran to try and get another look at it. All they found was it's tracks. Back at home Harlan told his family about the encounter, he said, "It was like nothing I'd ever seen before. Ugly and sinister and looking like something out of a horror movie. It swung around and looked at us for a moment, then tore off into the swamp. I want you to know it scared the heck out of me!" From Harlan's description the monster is seven feet tall. It's legs are slender but it's chest and shoulders were huge and it had long grayish hair on it's head and short dingy gray hair on it's body. It also had unusual eyes, Harlan said, "They were very large and amber colored and looked hard at us before running off." Harlan was an honest man and didn't care if people believed him or not. In 1974 on a duck hunt Harlan & Billy were in the swamps again. Near a maze of backwater sloughs they discovered a large dead boar with it's throat torn out. It's stench and smell told them it had been dead for a day or two. Further up the bayou they found another dead boar with the same kind of wounds. Harlan thought it might be gators doing the killing but the boars were too far up on land from the pond. They wondered why anyone would just leave them their to rot. After walking a while they came on to a pond stretched across a few acres. From behind the brush they saw ripples in the pond and thought it was ducks, so they got down and crawled to get a better shot. When they looked up they saw another large boar lying at the edge of the pond. It had a large gash in it's throat and blood was spilling into the water. Harlan & Bill saw tracks near the boar just like the ones they had seen back in 1963!. They decided not to stay around in case the creature came back to its fresh kill. plaster into them. With this proof Harlan contacted the Louisiana Wildlife Commission and zoologist at the Louisiana State University. All who examined the casts determined they were not a hoax and were made by an unidentifiable animal. The weight of the creature was estimated at about 400 pounds. Harlan, on later trips into the swamp cast several more tracks and continued to look for the creature. IN SEARCH OF did a TV program segment on the sightings and this media exposure allowed more folks to come forth and tell of their sightings. Today people are still seeing the Honey Island Creature in the wilderness along the Pearl river on both the Louisiana and Mississippi sides. Harlan Ford passed away in March 1980 from a heart attack. Harlan's sighting has been documented in a book, "Monsters of North America" and the "In Search Of" Program. A. Long hair on the head. Shorter hair all over the body. Head hair forming bangs somewhat over the eyes. Hair color is dingy gray. B. When Harlan Ford first saw it, it was on all fours, facing away from him. He said that it reminded him of an African lion from the rear. C. When the creature heard the voices of Harlan and his companion, it turned and stood upright on two legs , and made eye contact with the two men. The two men and the creature stood staring at each other as if sizing up the situation. D. The most outstanding thing the two men remember the most, was the size of the creature's eyes. He said they were disproportionally large, compared to the head and they were of an amber color. E. He said that the face looked like something out of a horror movie. It had a sinister look. F. Harlan described it as being about seven feet tall. It's loins were slender and it's chest and shoulders were tremendous. G. Harlan and Billy Mills, on another occasion found a series of three wild boars that were killed by bites to the throat. The first two were a good ways away from water, and had been dead a day or two. The third was lying in the water, with warm blood coming from it's throat and the hog was still kicking. Around the dying hog were the distinctive tracks of the creature. H. According to Perry Ford the creature makes a sound like a screech owl, except with more bass, and much more strength. I. According to Perry Ford, dogs will pick up the scent and run the creature. The creature circled his camp for many hours one night and had squalled for a while. Towards daylight a pack of dogs picked up the scent and made their way to his camp and circled it many times before making their way on out through the woods. M. According to Denny Crawford, a local with some knowledge of the creature, he knew a man who had lived in the swamp pretty deep and the man said that he believed that the animal migrated in and out of the area as it seemed to be more common at certain times of the year and gone at other times. N. Scientists, who examined the tracks, all agreed they were not hoaxes. 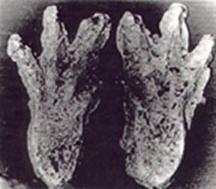 The webbed toe imprints appeared to be a cross between a Primate and a large alligator... an impossible mixture. The scientists estimated the creature's weight at about four hundred pounds. O. When Harlan and Billy first encountered the creature and it ran, they got the impression that it would go down on all fours any moment. As it disappeared into the brush they saw it appear to go down on all fours again. P. They, at that time, gave chase into an island or isthmus with only one way in and they could not locate it. They circled the island and could not find tracks going into the water. Conclusions: This creature seems to possess both primate and feline characteristics. It seems to have chosen the trees as opposed to the water when pursued. It killed by biting the throat, but did not immediately eat its prey. Dogs will pursue this animal. photos of the swamp, visit it here. Ted Williams lived on the bayou most of his life. He was a trapper and worked on the swampland every day. Ted claimed to have seen the creature many times, and he knew there was more than just one of them. He said, "I could have killed them, but I didn't cause they didn't seem to want to harm me. I'd see them swimming the river and get out on the bank then dissappear in the swamp." One day while fishing one crossed the river and walked right past him. One day Ted took his boat deep in the swamp to set trout lines. He was never seen again. No one has ever found him or his boat. Video available on Video Page. Hear Ted tell his story in his own words. Is the Honey Island Swamp Monster a Bigfoot? Read these reports from the GCBRO database of Bigfoot type creatures seen in and near the Honey Island Swamp! This is a comparison of the Honey Island Track and a local Alligator track. Though the tracks are similar, they are not the same. Honey Island Swamp Monster Track Above. Purchase Your Own H.I.S. Cast Here!  The Gator tracks are straight toed, the H.I.S. toes bend downward.  The Gator track curves at the heel, no curve on the H.I.S. track.  The body of the gator track is longer.  The H.I.S. Track has a bump or ridge at the onset of the toes.  The H.I.S. Track is three-toed with a fourth lower, the gator is four-toed. Need to contact the H.I.S. Team? An analysis of eye witness reports , regarding the possible nature of the animal. First of all I would like to start off with the testimony of South Louisiana resident Ted Williams, who's interview was featured on the Alan Landsburg show " In Search Of." I will also comment on information taken from interviews with Perry Ford and Dana Holyfield regarding Mr. Williams story. Some of Mr. Williams interview is featured on this website. 1. Mr. Williams stated that the first time he saw it , he thought it was a stump. He said it was about seven feet high. Well...we can assume that it was between six and eight feet tall and be safe. It seems that it would have been a mighty big stump. You have to go to the area to appreciate how tall some cypress stumps are . There are stumps that tall down there. 2. He said it jumped a bayou. I don't know if this was on two feet or four. When Harlan Ford first saw it , it was on four, but raised up on two legs , and then ran off on two. However , according to Perry Ford , it appeared to go down again on all fours , as it went into the thicket. 3. Mr. Williams stated that it had hands , almost like a human's. 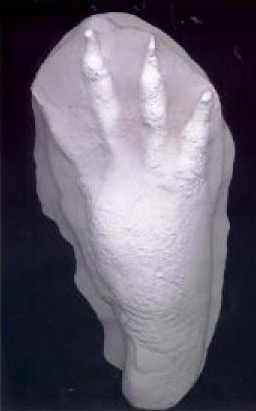 Well almost , is not completely like a human's hand. The people down there in South Louisiana , who regularly go into the swamp , are astute observers of the flora and fauna. It's safe, in my opinion, to say that the creature's hands are not completely like a human's. Harlan Ford said that he found where the animal went down on it's front feet to drink, and the print revealed it had heavily clawed front feet. 4. The animal was observed swimming the Pearl river , by Mr. Williams. He said that they swam with long overhand strokes, like a human. He said they were broad shouldered. I take this to mean that the shoulder motion would indicate a ball and socket shoulder joint. This would favor brachiation as a fair description of the animal. ( capable of hand over hand motion). This is both surprising and perplexing. This would be a primate trait. 5. Mr. Williams stated privately that two of the animals swam the river and ascended the embankment , close enough to him that they "shook water " on him. 6. These animals are described as having a "mane" of hair . Harlan Ford stated , according to his son Perry, that from behind , the animal reminded him of an African Lion. The musculature was similar. Interestingly enough, while interviewing another Local about the area , he mentioned to me that African Lions are seen from time to time. He was not aware of what Harlan Ford had described. There is no tail described. The face is said to be rather flat. 7. The most prominent feature described by Ford and others , is the size and color of the eyes. They appear to be disproportionately large , and of an amber color. Mr. Ford stated that this gave the animal a "sinister" look. 8. The tracks , left by the animal , appear to be somewhat similar to an Alligator's rear foot. Upon close examination , however, it becomes clear , that this is something different. I refer to my previous statement about the Locals observational skills. They had no problem at all distinguishing this track from an alligator , which they regularly kill , and eat. There are four toes visible. There are three heavily clawed toes , with prominent knuckles , underneath the foot. Then... there is the bizarre thumblike small toe . About an inch and a half on the cast that I have. These toes show clearly , that this animal can grasp with the toes. 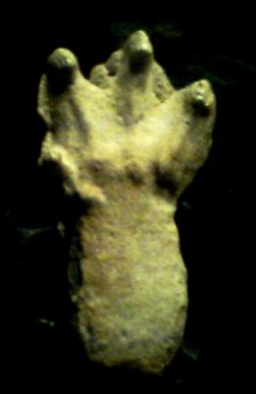 The three large toes , are long and slender , with tendons visible in the prints. The claws are turned down , and backwards to grip the loose soil , sand , and mud. This is reminiscent of a cat like trait. The skin appears to be thin on the bottom of the foot , with tendons showing. In the hostile environment of the island , thin skin under the foot would indicate that it didn't spend a lot of time on the ground. 9. On one occasion the animal was said to have killed three wild hogs , all found in the same area , with the distinctive tracks around them. All three were killed by bites to the throat. The last being still kicking and bleeding. None were eaten. This might mean , perhaps , that the animal , for some reason , was being territorial. Perhaps with young ones . The biting of the throat , would be a cat like trait. 10. Perry Ford spent the night fending off this animal by lighting off a fire. He stated that he first heard it way up the river. It was a loud " squall". It should be noted that these people know their sounds , and a "squall" is markedly different from a scream or roar. He said that the animal had cut the distance in half , by the time he heard it again. The animal was moving along the river rapidly. The third time he heard it was at close range. He said the "squall" was loud and similar in nature to an owl scream , but with leaf shaking resonation. The animal stayed near him , squalling and sounding as if it were "rolling logs over" , just out of sight of the firelight. Towards morning it left. A pack of dogs , later picked up the trail and ran the animal.